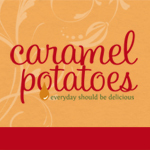 Caramel Potatoes » Happy Turkey Day! Turkey Day is fast approaching – I can’t wait! The best part of Thanksgiving, of course, is being with family and friends. We always like to come up with fun ways to involve the kids- Candy, of course, always grabs their attention! This year, we decided on these adorable turkey cupcakes made with REESE’S® peanut butter cups, candy corn, and candy eyes. As you can see, these little guys are almost too cute to eat! What fun for you and your little gobblers – this will keep them busy while the turkey is roasting and they will love seeing these little guys on the dessert table! Frost cupcakes with chocolate frosting. Place a REESE’S® peanut butter cup on top. Create tail feathers with the candy corn. Use a little chocolate frosting to adhere eyes. Cut the point off a candy corn and adhere with frosing for the beak. I don’t think these little gobblers will last long! Happy Turkey Day! Here’s a great deal to save you time and money – something we all need more of during the holidays! 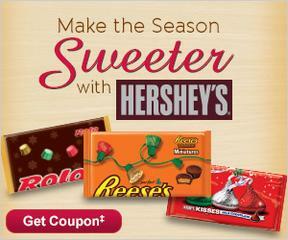 Click HERSHEY’S® Holiday Savings for SWEET Savings on REESE’S® at your local CVS! Save up to $2.50 on two 8 ox. bags of HERSHEY’S®, KISSES®.REESE’S®, or ROLOS® candy at CVS.